I am on the bus back to Montreal. 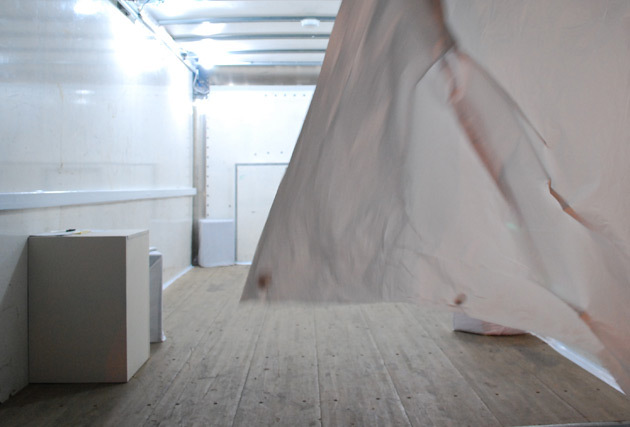 Yesterday we exhibited White Loop at the Nuit Blanche in Toronto. My backpack contains a plastic bag filled with many handwritten dream submission on paper slips. This being my first Nuit Blanche in Toronto i was surprised at the large of amount of people who go out and experience art for one night, and at the large amount of people who were more than eager to participate in our installation by leaving us notes about their own dreams. The collection process over the website has been painfully slow in comparison. 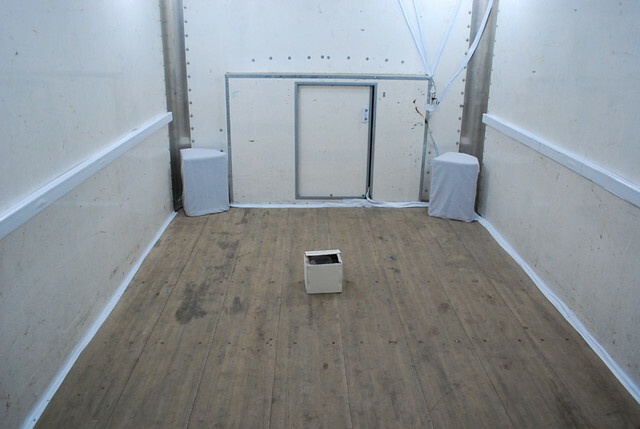 The mixed audio installation was presented in the back of a rented cube truck. All along Queen Street W. in the Parkdale neighborhood, several of these trucks were parked and exhibited performative, installation and interactive media art projects. It all ran under the initiative Leitmotif. Having to go collect the truck and then drive it all over town (that is not your own) – collecting various installation equipment (plinth, speakers, amplifier, etc.) – was a bit of a challenge. Luckily Mara managed the big truck easily, and we arrived at the installation site unharmed. Setting up the installation basically required large amounts of white duct tape (a shout-out here to my other recent adventures with duct tape). Thanks to volunteer Danny we managed to wire, tape, cover and install everything in a decent time before the big opening of the Nuit Blanche at 7pm. The installation consisted of 4 100-Watts speakers positioned at the corners of the cubic space. A 3-minute soundfile looped continuously over the whole night. The sound file was the meshed down result of playing 100 recordings – of people telling us their dreams – at the same time. It was still possible to tell that the audio came from the sound of voices, yet it was impossible to pick up individual spoken words. The sound was a murmuring waterfall of white noise, similar to what a big cafeteria sounds like. We invited people to submerge themselves into the sound, and let their subconsciousness pick up content from the 100 dreams, that hopefully would re-emerge within their own dreams at night. 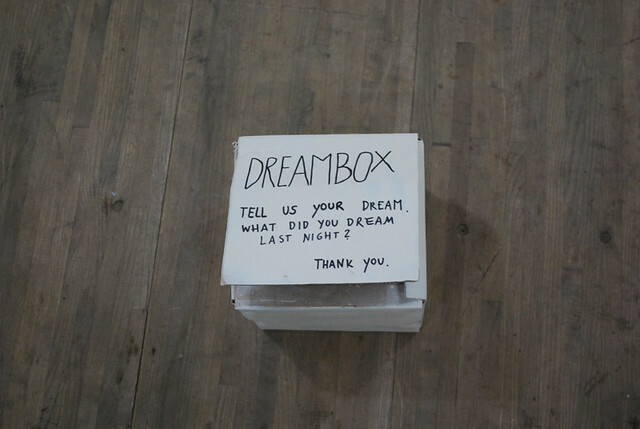 Additionally we supplied paper and pens and asked people to submit new dreams for our collection. Even with elimination of the wrong sort of dreams (“I want to become a more loving and understanding person!”) we got an impressive amount of submissions. People even enjoyed browsing previous submissions before leaving their own. Needless to say, it got rather cold at some point during the night. We managed to hold out until 4am, but then we had to flee the scene towards hot showers and warm beds. Toronto – it was lovely, thank you for your participation in our little project! See you soon! 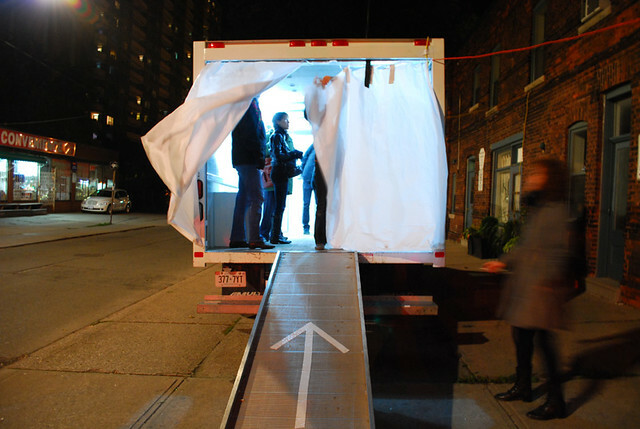 Posted in Blog and tagged 2011, dreams, exhibition, installation, nuit blanche, participatory, sound, Toronto, white loop.